This question is about the final burn in the landing sequence of the Falcon 9 first stage return to Earth tests. If I understand correctly, there is usually far more thrust than there is weight at this point. If the maneuver took place a little higher up, the first stage would simply reach zero vertical velocity and immediately start accelerating back up again until it became unstable (see this answer and all the associated comments) or ran out of fuel. I'm trying to understand the issues behind a landing abort and re-try and the associated balance of thrust and weight for which one of the many considerations is the initial fuel loading. An abort and re-try could be made more feasible if two or only one engine were used once this phase began. Three engines might send the stage too high too fast. Shutting down two engines and doing this with a single engine would improve the possibility that this emergency procedure might work. However any further discussion of that belongs with this question. Here, I'm asking specifically: Can Falcon 9 first stage landing final burn using one, two, and three engines and what are the Tradeoffs? The following two quotes are from a list of Falcon 9 first stage landing attempts - these two contain some information about the number of engines used, but it's not enough to make a definitive list of the number of engines used in the final burns of each landing. Flight 24: Pursuing their experiments to test the limits of the flight envelope, SpaceX opted for a shorter landing burn with three engines instead of the single-engine burns seen in earlier attempts; this approach consumes less fuel by leaving the stage in free fall as long as possible and decelerating more sharply, thereby minimizing the amount of energy expended to counter gravity. Flight 26: The landing failed in its final moments due to low thrust on one of the first stage engines, caused by the exhaustion of its liquid oxygen fuel supply. That caused the engines to shut down early while the first stage was just above the drone's deck, causing a landing failure. As you note in the question, for higher performance missions, they have tried more aggressive landing burns. The issue is, also as noted, they have thrust at lowest throttle, greater than the mass of the stage at landing. So hovering is out. Coming down gently is out. Thus they perform their 'hover slam' (They should trademark that!). That means they come down at a terminal velocity they chose (through aerodynamic effects) and then fire the engines as short a time as possible in order to reach 0 altitude at 0 velocity. Even with one engine having more thrust than their mass at landing time, they still need to kill that terminal velocity. The faster they do it, the less fuel they spend doing it. The longer they take to brake the more energy is wasted fighting gravity. It seems that the first burn, to slow down the forward motion and head back to base (LZ-1 or ASDS) is done with three engines, since they just spent 2 and half minutes getting up to speed with 9 engines. The next burn is designed to guide them through the atmosphere as things get hot, and coming in too fast will melt the stage. Finally the third burn is to actually land. On that second burn, they have tried three engine burns for shorter in order to save fuel. For the landing burn they have started with three engine burns, then reduced down to one, since three engines is just way to much thrust at landing to meet their goal. As noted, the advantage to doing a higher thrust burn is that it takes less time and therefore uses less fuel. The main advantage to a slower final approach is that it gives more time for the guidance system to correct the rocket's trajectory. Any guided landing procedure involves a cycle of estimating the accuracy of the current trajectory and steering to correct the error, and the more time allowed to make corrections, the better. SpaceX seems to have settled on using one engine for the very last part of the landing even on three-engine approaches; for symmetry reasons this more or less eliminates the possibility of a two-engine approach, because you'd have to change over from two outboard engines to the center engine in a fraction of a second, and engine start times are slightly variable. Not the answer you're looking for? Browse other questions tagged spacex falcon-9 landing abort merlin-1d or ask your own question. 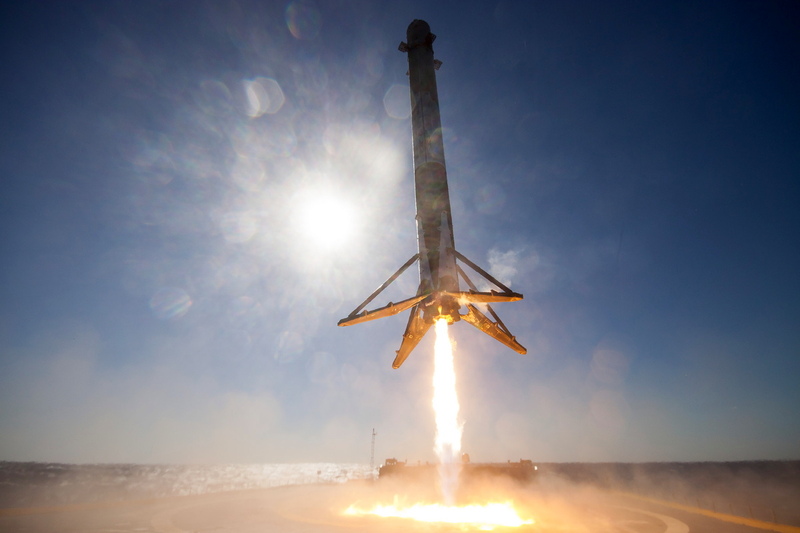 What went wrong, Falcon 9 1.1 first flight with first stage landing attempt? What is the cause of this Falcon 9 first stage “dance” after landing?